Marjorie Alderman – Van Heck Funeral Home Ltd.
Peacefully, with family by her side, at Bluewater Health, CEE Site, Petrolia, on Tuesday, February 5th, 2019, Marjorie Jean Alderman (nee Gentleman) passed away in her 103rd year. Predeceased by her husband Maurice Alderman. Beloved mother of David (Carol), John (Joan) & Ross (Dorinda), Loving Grandmother to late Donnie, late Rob (Barb), Tom (Stacey), Kim Lee (Simon), Peter (Nikki), Allison Bullock (Michael), Sarah Alderman (Todd Gillis), Kaitlyn and Jennifer. Treasured Great-Grandmother to Madeline & Charlotte, Brody & Andie, Dave & Kate Lee, Leah, Avery & Emily, Quentin & Brooklyn Bullock, Grayson & Cole Gillis. Survived by her sister Elizabeth Spearman (late Ivan) and many nieces and nephews and their families. Predeceased by her parents David & Eva (Smith) Gentleman, sisters Kathryn Bridges (late Claire), Mildred Jackson (late Robert) and brothers Bertrand and James Gentleman (late Norma). 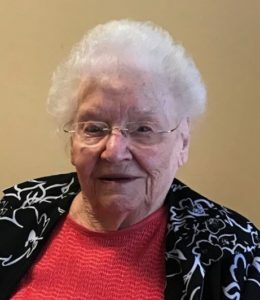 Relatives and friends will be received at the Van Heck Funeral Home, 3232 River Street, Alvinston on Sunday afternoon from 2-4 p.m. where the funeral service will be held on Monday, February 11, 2019 at 11 a.m. Rev Jim Breen officiating. Interment to follow at the Alvinston Cemetery. Memorial donations may be made to the CEE Hospital Foundation. The family thank the staff of Fiddick’s Nursing Home and CEE Site Petrolia for their exceptional care.